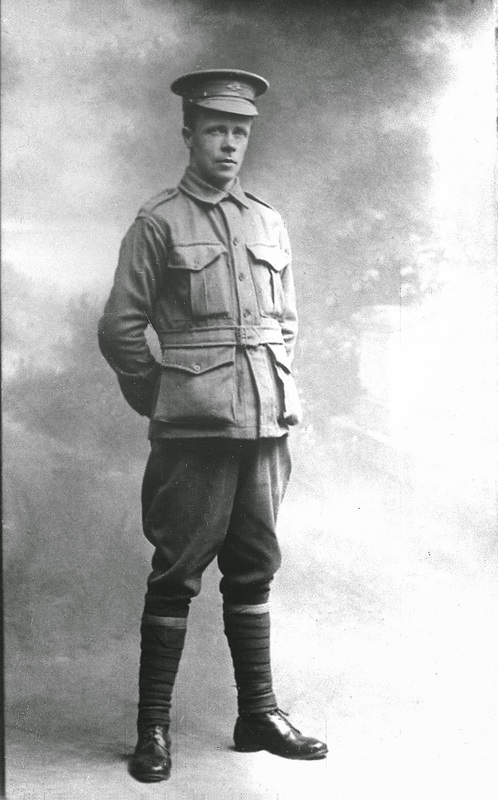 Leaving his life as a farmer at Dairyville near Coffs Harbour, Edwin Mather Hartley, aged about 36, enlisted in the Australian Imperial Forces to fight overseas in WW1. It was 2nd August 1915 and he had put his age down to 31. Soon afterwards, he was shipped to Egypt with the 2nd Infantry Battalion, 12th reinforcements, arriving there on Monday 18 February1916. Five weeks later “to the day”, as he wrote to his distant cousin Emily back in Australia, he had been in the camp hospital for a week with “Henflewenza” but was quite well now. That letter was kept in a tin box of “Aunty Em’s letters” for decades along with its sad companion – the letter, really only a note, which Em penned in reply – stamped “Return to Sender – Unable to Trace”. Over the years my mother and her cousin wondered, “Whatever happened to poor Edwin?” and vaguely thought about writing to Canberra. Determined to find the answer to this mystery I clicked a few times with the computer mouse on the Australian War Memorial Site and found the news we half expected. Edwin was killed at Pozieres in France between 22nd and 25th July 1916. I was shocked by documents from a detailed investigation conducted throughout 1917 into whether he was actually killed and then, whether his body had even been buried. Five facsimiles of letters in the old-fashioned blotchy Times font of a manual typewriter are reproduced on the website and all the gory details from the eyewitnesses to Hartley’s death are included. I felt enormous sympathy for his poor father Henry Hartley, who had already suffered the tragic loss of Edwin’s mother just as their ship arrived in Australia in 1880. Edwin’s accent was still strongly that of a Yorkshire man, even though he came to this country as a child of two, for he put the extra “H” sound in front of the word “influenza” which he spelled so imaginatively. In the one and half pages he wrote to Em he expressed his wonderment at the “wonderful sightes to see here the Pyrmids is a wonderful piece of work the big stones in it, and the heights of them is marvelious.... old boats & Coffins in glass cases, [in the museums] so that you can not touch them, as they are crumbling away with old age”. He observed “the cow & calf [being led] around the town selling milk, from house to house, anyone with a camera could get some good snaps here”. His pen and ink handwriting is executed in neat and well-formed copperplate letters with a very even slope and I get a sense of his thoughts and impressions flowing out keenly and effortlessly. The teachers at Leichhardt Public School in the 1880s and early 90s impressed this skill into him even if his spelling is more erratic. 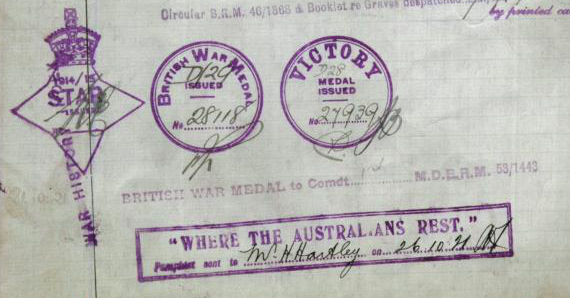 Until I read the details his brother John Henry Hartley of Karangi provided to the War Memorial I knew nothing about his parents Henry and Elizabeth Hartley. My gran had never mentioned her great uncle and his two sons who had already been in Australia for 25 years when she arrived here with her family in 1907, but obviously the families were in touch or there would never have been a letter from Edwin to Emily. There are still many people in the Coffs Harbour and Bellingen districts and also in more far-flung parts of Australia who are descended from Edwin’s brother and sister-in-law, John Henry Hartley and Mary E. Pearson. Edwin’s niece was Nellie Ruthetta Hartley born in 1917 who married Herbert A. Shephard in 1937 in Coffs Harbour. Edwin sent a souvenir silk cushion showing the sights of Egypt to Nellie Ruthetta and you can see it proudly displayed in the Coffs Harbour RSL to this day. And to this day, Hartley relatives talk in hushed tones about his little nephew John William Hartley born 9 July1919 who sadly drowned in the Orana River aged 4. Ruthetta was the name of Henry Hartley’s sister back in England and I have a huge family tree of all ten siblings and Hartley's reaching back to the 1700s in Yorkshire. One more recent connection says Muriel Hartley, another of Edwin’s nieces, was a nurse to the famous Sara Quads. I have started to get to know my 3rd and 4th cousins from the Coffs Harbour and Bellingen districts and added their names to the family tree too.